It's Takedown time again, and this time up it's the gyro meat of my dreams, lamb! Look at the adorable punk lamb on the poster, don't you want to just eat him slowly roasted and smothered in tzatzki sauce? I do. 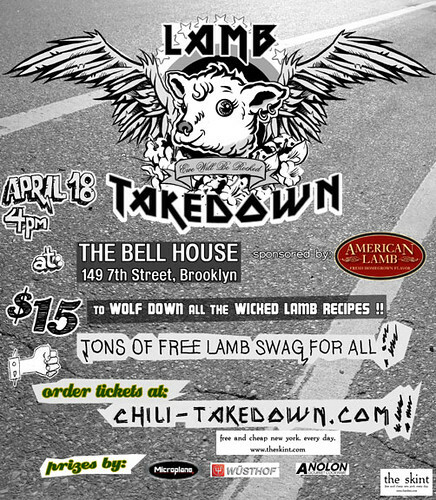 Two Sundays from now, the 18th, it's lamb time at Brooklyn food competition location du jour, The Bell House. $15 and you can see lamb cooked in ways you've probably never thought of before (and a couple where you have.) The whole hot mess starts at 4pm, but you want to make sure you get in right? If you're smart like us, be sure to buy your tickets now by clicking here. And oh yes, we'll be there. If you want more information on this and other Takedown events, please visit Mr. Matt Timms site at chili-takedown.com.